It was after a trip to New York in the mid 1920s that German director Fritz Lang and his wife and collaborator Thea von Harbou concocted the masterpiece that is Metropolis. Inspired by the skyscrapers of Manhattan, Lang, a former architect, imagined a futuristic city built on the sweat of workers who remained hidden underground. Fleshing out their story the writers devised a saintly character named Maria who provided these poor unfortunates with some solace after their days’ hard yakka at the hungry wheels of industry. When Maria takes a clutch of urchins up to confront the decadent oppressors in the luxurious Eternal Gardens, she is spotted by Freder, the son of the city’s mastermind. Naturally it’s love at first sight and, like many a myth and metaphorical tale before, he is drawn into the underworld in pursuit of her. It’s this journey of awakening that leads our hero to broker a deal between the workers and his father with the idealistic realisation that the heart must mediate between the head and the hand. 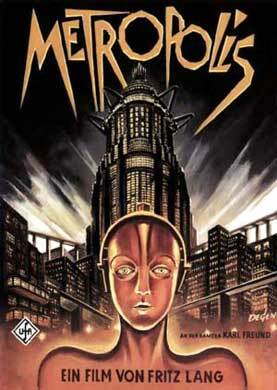 Made in 1927 Metropolis used hitherto unknown cinematic techniques to create an imposing sci-fi world including trick mirrors, multiple exposures and frame-by-frame animated shooting. In perhaps the most dazzling sequence we see the mad inventor Rotwang transform a metallic robot into a flesh and blood woman, a dead ringer for Maria only false and inherently evil. Brigitte Helm displays and awesome range playing both Marias and while the silent screen acting can seem quite melodramatic, it is a style that absolutely suits the material. Metropolis has now been meticulously restored and reconstructed with footage not seen since the 20s. This classic has been recognised by UNESCO by being the first film to be included in its’ ‘Memory of the World Register’. To actually be able to own a copy on DVD is a real treat and something that not even its visionary creators could ever have imagined.